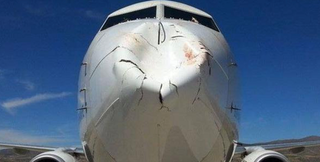 Looking at the caved-in nose of this Boeing 737-800, you’d think it flew into a flying water buffalo. But the damage was caused by a single bird — a potent reminder of what can happen when objects collide at high speed. The incident occurred earlier this week during Turkish Airlines flight TK2004 from Istanbul to Nevşehir. The bird struck the plane as it was landing, but the pilot managed to land without incident. None of the 125 passengers were injured. The nose cone “of a plane is being constructed by soft materials (composit) to minimalize the impact of such hits. Therefore, such standard/normal deformation occurs as a natural result of such incidents,” Dr. Ali Genc, Turkish Airlines senior vice president of media relations, said in an emailed statement. Bird strikes are indeed dangerous when they hit the engine area, as witnessed by the 2009 incident when US Airways Flight 1549 made an emergency landing in the Hudson River off Manhattan.